Your backups are available from the Backups view of your project. It shows the Scheduled and On-demand backups that have been created. In each case, the backups page willlists when and what was backed up, with additional information and options to restore or download the backup. The On-demand view will also provide options to create new backups. On-demand backups are made according to the project's backup schedule, and require no intervention from the use. On-demand backups can be made whenever you require. To make a backup, select Backup... for the server you want backed up. In the next dialog, choose whether to backup database, media or both, and optionally add a note to the backup. 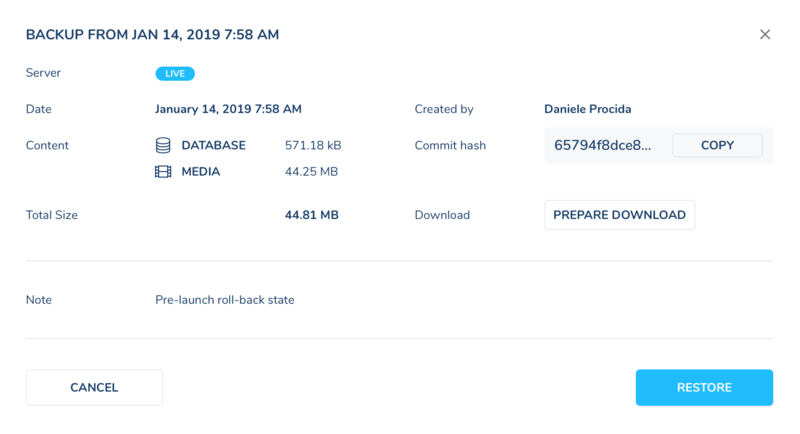 When you hit Create backup, the process will be started; once completed, the backup will appear in your list of backups. You can also select a particular backup to view in more detail. Amongst other things, this also shows the Git commit hash that applied to the project at the time the backup was taken - this is particularly important in cases where a database dump is no longer in synchronisation with the codebase. The Restore functionality gives you flexibility. You can choose what to restore (database or media) and its destination (project and environment). Be warned that a restore operation will overwrite content at the destination. Take a backup before restoring unless you are sure you will no longer need that content. To download a backup to your own computer, select Prepare download and choose the content you want to download. The files will be prepared asynchronously, and an email message containing links to the database and/or media files will be sent to you when they are ready. The media files will be made available as a tarred archive, and will include a manifest file listing contents.